It's been a busy few years for Anurag Kashyap. Over the last two months we've seen the North American release of his five and a half hour crime epic Gangs of Wasseypur and the Indian domestic release of his kidnapping thriller Ugly, both after lengthy delays. Kashyap has not been twiddling his thumbs in the meantime, however, and he is now preparing the release of his jazz era crime film Bombay Velvet for release on May 15th. Bombay Velvet marks a milestone for Kashyap for several reasons. Most importantly for his film's box office future, the film is the first of his to feature A-list Bollywood talent in the top roles. Previous films have featured performers who went on to be big names, like No Smoking's John Abraham (who was on the rise at the time) and Dev D and That Girl in Yellow Boots' Kalki Koechlin, but Kashyap typically prefers to rely on character actors in his film. Men like Kay Kay Menon, Manoj Bajpayee, and Nawazuddin Siddiqui are very well respected in the filmmaking community, but not huge box office draws. For Bombay Velvet, Kashyap tapped Ranbir Kapoor (Barfi) and Anushka Sharma (PK) to anchor the film. Thankfully, both are very talented performers who only rarely get the opportunity to show their skills in the blockbusters they typically find themselves saddled with. 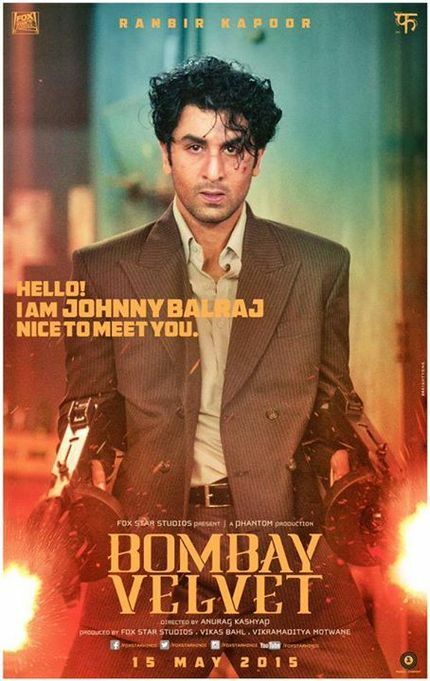 Our first look at Bombay Velvet came out yesterday, and this fantastic looking image of Ranbir Kapoor as Johnny Balraj toting twin Tommy guns gives me hope. Bombay Velvet hits Indian cinemas on May 15th, there will be an international cut of the film edited by Scorsese's right hand woman Thelma Schoonmaker as well, so I'm not sure if that Indian release will be worldwide or if we'll have to wait. Hopefully by the time a trailer hits the web, those things will be cleared up.